Market data in the June quarter showed with certainty for the first time ever that Apple's iPad is replacing sales of traditional PCs to schools and students, according to one analysis. Charlie Wolf with Needham & Company said in a note to investors on Tuesday that PC education shipments fell by 265,000 units, or 13.9 percent, from the June quarter a year ago. Apple, meanwhile, sold nearly a million iPads in the K-12 market in June, which he said is "definitive evidence" that the iPad has been "cannibalizing" PC sales in the U.S. education market. Apple's iPad sales in the June quarter were double what the company sold a year prior. The iPad also reached nearly double the number of Macs Apple sold to education buyers during the quarter. "Clearly, a significant portion of iPad sales represented an expansion of the market," Wolf wrote. "But in view of the fact that Mac sales held steady at around 520,000 units but overall PC sales declined by 265,000 units from 1.90 million to 1.64 million units, we believe the inescapable conclusion is that the iPad is beginning to cannibalize a material portion of PC sales in this market." In Wolf's view, sales of the iPad to the education market are only the beginning. He believes the iPad will begin to meaningfully chip away at PC sales in other, larger markets in the near future. While the iPad had a strong June quarter, it was a mixed bag for the Mac. 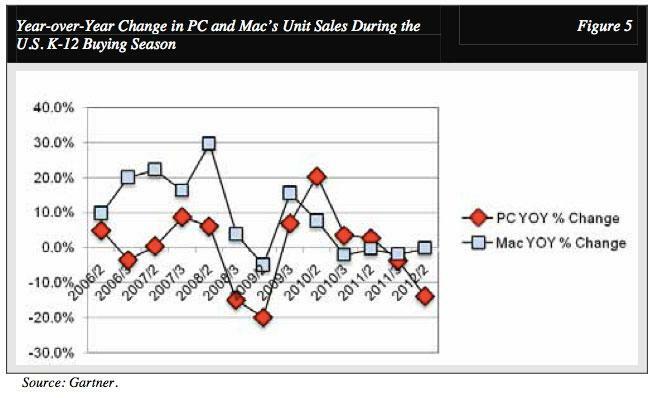 Sales of the Mac were strong in the U.S. business market, where it saw 56.6 percent year-over-year growth compared to an 8.8 percent decline in PC sales, but the worldwide home Mac sales fell 4.6 percent. Apple reported in July that it had reached a new all-time quarterly record for iPad sales, reaching 17 million. Mac sales, however, grew only 2 percent year over year, but that was still enough for a new June quarter record on sales of 4 million units.